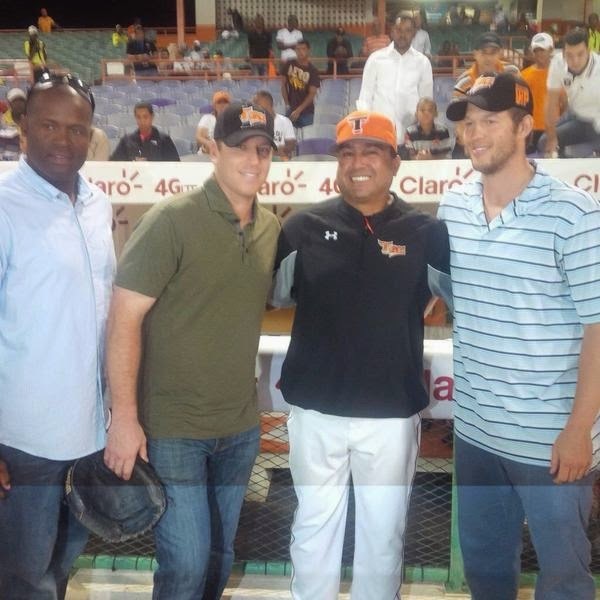 Clayton Kershaw and AJ Ellis visited the Toros del Este of the Dominican Winter Leagues yesterday. In the photo above they are standing with Luis Dorante and Amaury Telemaco. Kershaw threw out the first pitch. Photo above via @DodgersPR on twitter. Via Cary Osborne at Dodger Insider, "Doubles king Corey Seager completes tremendous season." During the minor league regular season, Seager led all players with 50 doubles. It was the first time a minor leaguer reached the 50-double mark since 2011 (Toronto farmhand David Cooper had 51 for Triple-A Las Vegas). There have only been four occurrences where a minor leaguer has had 50 doubles in a season since the turn of the century. Via David Hood at True Blue LA, "2015 top Dodgers prospects overview." Via Mark Saxon at ESPNLosAngeles.com, "Other than LA, retirement for Haren?" I absolutely respect his viewpoint. "My signing with the Dodgers last year and my decision to exercise my player option were based on my desire to play in Southern California near my family," Haren told ESPN in an email. "I had other opportunities but at this point in my career I have no interest in playing in a city away from my family." Via David Venn at MLB.com, "Puig reflects on first Japan Series experience." "All of the discipline they have," he said. "Everything is about respect, almost as if [the players] are apologizing. And the fans are great. They support their team from the first inning to the ninth. That's a nice thing." Via Jamal Collier at MLB.com, "Wills hopeful for induction into Hall of Fame." Check out some unique player themed apparel from Topps, here. 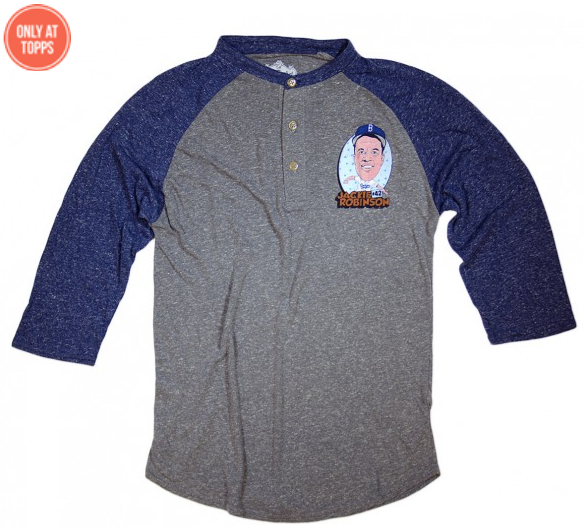 Below is a Jackie Robinson shirt that they call a 3-button henley. There are other t-shirts featuring vintage Baseball cards of stars like Nolan Ryan, Ryne Sandberg, Ozzie Smith, etc.